Like most (all?) women, I am crazy about accessories. I’ve never met a purse, scarf, shoe, or necklace that I didn’t love. And while I may not be totally confident in all aspects of the fashion arena, I feel like I’ve got accessorization nailed down. Another of my great loves is organization. I can hardly look at a drawer, shelf, or closet without getting the itch to create order from chaos. Alphabetized DVDs, color-coded bookshelves, and adds for the container store all make me swoon. Given my twin passions for accessories and organization, you can imagine that I take the organization of my vast accessory collection very seriously. My pursers are lined up neatly on a shelf in my closet, my shoes are sorted by type and housed in a wire shoe rack, and I have an entire dresser drawer dedicated to my numerous scarves. The one area I have found a bit more challenging to organize is my jewelry. Until recently, I had a system that was working for me, but this last Christmas I received a few new necklaces that put me over capacity in my ability to store them. My necklaces were all piled onto three hooks, and while they fit, it was hard to see what I had, and with so many necklaces on each hook, they frequently got tangled. 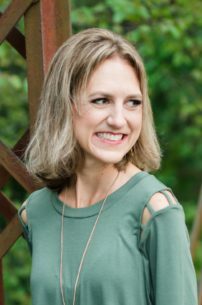 So, I did what any jewelry- and organization-loving girl would do: I headed onto Amazon to find a new organizer for my growing jewelry collection. After spending entirely too much time sorting through my options and reading through customer reviews, I settled on this metal wall mount jewelry organizer in classic black (the other option was white). The organizer came in two sizes – 10.5 inch and 17 inch – and I decided to go with the larger one. At $29.99, this organizer was not my cheapest option, but it cost significantly less than some of the other organizers I had looked at. While I had initially been looking only for necklace storage, I liked that this organizer could also hold bracelets and earrings, which would allow me to get rid of some of the smaller containers I had been using to store these items. When my organizer arrived two days later (thank you Amazon prime! ), I was thrilled with my purchase. It was both durable and attractive, and it offered much more storage than the pictures had indicated. It was relatively easy for (my husband) to mount, and once it was hung, I set to work filling it with necklaces, earrings, and bracelets. I chose to hang necklaces from the back hooks and front bar, and used the side bars to house my bracelets. I also filled the upper row of earring holds with my stud earrings; I suppose these could hold dangly earrings as well, but they would hang down over the front bar, making it difficult to unhook the necklaces I have hanging there. I already have a good storage solution for my statement earrings, so this wasn’t a concern for me. While I’m using my organizer for jewelry only, it would definitely be sturdy enough to hold purses as well. Also, the top of the organizer if flat, so it, too, could be used as a shelf to hold additional items. Some of the Amazon reviewers noted that they use this shelf to store perfume and other cosmetics. For now, I like having that surface clear, but it’s good to know that I have the option of using it for more storage. 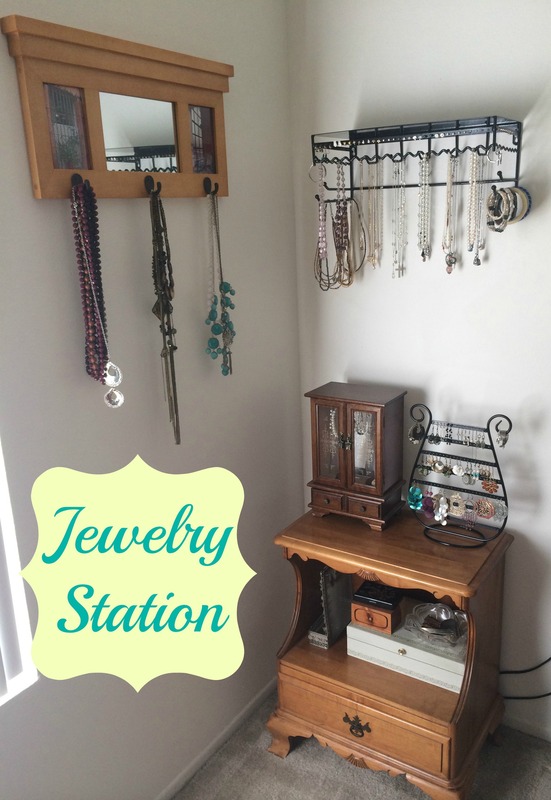 I am thrilled with how my jewelry organization turned out. 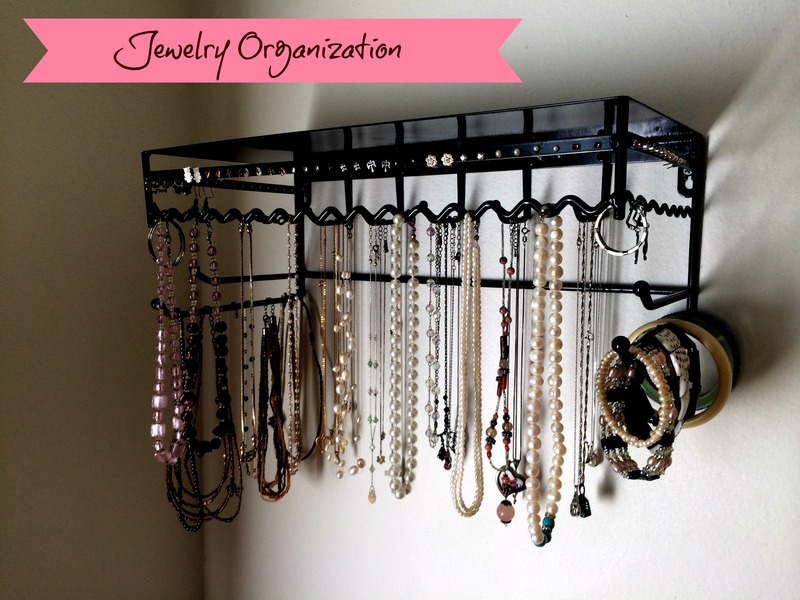 The wall mount organizer was just what I needed to take my jewelry display from acceptable to exceptional. I am now able to see and access each of my bracelets and necklaces, and I even have some room to expand my collection!